I made this little pocket book years ago before I knew anything about Artist Trading Cards (ATCs). It is the perfect size for them at 3" x 4" and an easy project as it only uses one sheet of 12" x 12" paper. The trick is finding the right paper. My first book is made from a wonderful sheet of lightweight yet sturdy paper that is almost fabric like. It feels like a suede on one side and more like paper on the other. 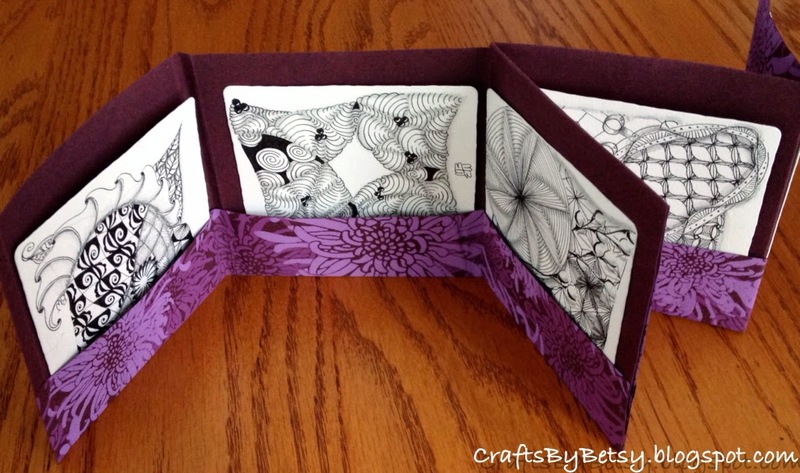 Once I found Zentangle, it has held up well carrying either ATCs or my tangle instruction cards. There are 8 pockets so it can carry a nice variety of cards. 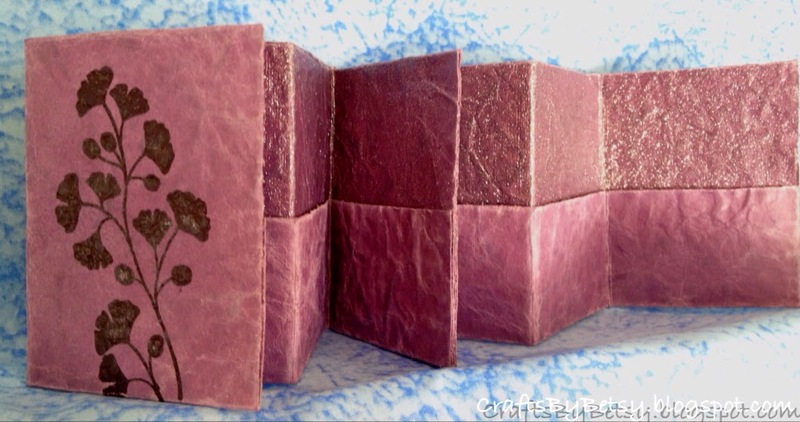 I took this mini book to my CZT seminar along with its modified version to hold tiles. I thought I'd share the "how to" information with you today. I even found the link to the YouTube I used initially here! I went in search of some similar paper to what my original book was made from. Easier said than done. You need 12x12 double sided paper but I just wasn't finding that durable fabric quality. As I pondered this problem, I thought maybe I could make the solution from the faux leather technique! Here's the link to my earlier post about the faux leather. 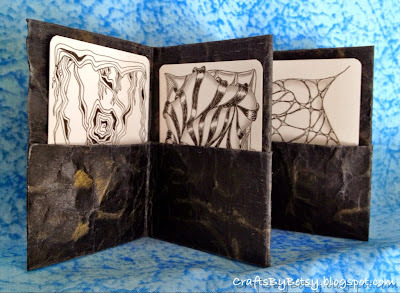 So I simply used typical scrapbooking cardstock for the faux leather and here are the results. I would suggest NOT using a white core paper as you will likely have some white, worn areas showing after going through this technique. My faux leather mini books are about three times thicker than my original, (faux leather book is approximately the thickness of half a deck of cards) but seem to be very sturdy. I simply inked and sealed both sides instead of adding fabric to one side. I'm very happy with them but am still on the look out for the perfect paper. To make the mini book for the 3.5 x 3.5" tiles (the book is 4" x 4") modify the instructions to use a 16" x 11" piece of paper. This example is cut from a double sided poster sized specialty paper found at an art supply store. I modified the original instructions so that the pockets are only 1.5" deep. The stamped image on the front of my original mini book (tan) is from Paper Parachute and was heat embossed. I'd like to give credit to the smaller stamp image on the pockets as well, but I just can't locate the stamp (could I have a lost stamp? Oh my!) If anyone knows the company, please let me know so I can give appropriate credit. 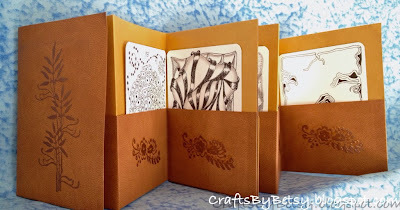 The stamped images on the faux leather are from Stampin Up! using Stazon ink. I felt only two were smooth enough to stamp on after the faux leather technique. Oh goody...more new things to try! Oh crap! I deleted your comment instead of replying….I swear it wasn't the Zentangle police! Sorry, Your idea is fabulous! I can't wait to see pics!